Praia da Quixaba Beach, Fernando de Noronha, Brazil. Praia da Quixaba is a very small beach that lies between the Praia do Bode beach and Cacimba do Padre beach. Praia do Quixabinha is also called the Quixabinha beach. 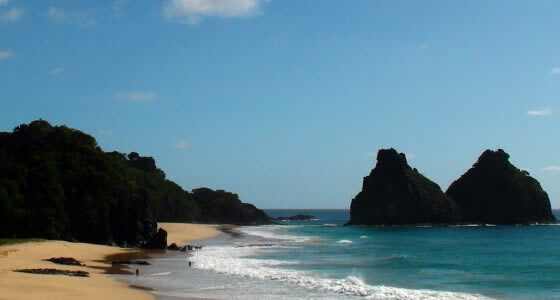 In fact Quixabinha beach is a continuation of the Praia do bode beach or the Goat’s beach. The waters of Praia do Quixabinha beach is quiet and calm during low tide and the sea can get quite rough and agitated during high tide. Since you come across this beach while you are heading to the Cacimba do Padre beach, there is nothing much you can actually do, except stop for swimming. But if you choose to hang around on this beach then you will get to watch some sea birds from the pelican family. If you happen to sight these birds then it’s worth catching their activity. These sea birds are usually found hunting for food in the waters of the Quixabinha beach because there isn’t much of human intrusion or tourist activity to disturb them. However, the key is to maintain the lowest possible noise levels if you want to watch these sea birds in action. Since the Quixabinha beach is very small there are no drink stands or watering holes on this beach.